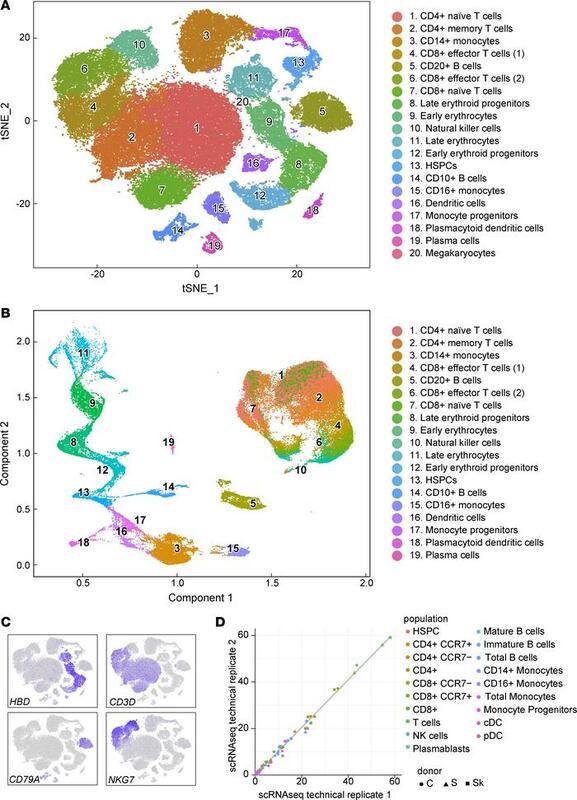 Single-cell RNA sequencing of healthy bone marrow cells. (A) Cluster identification visualized using t-SNE. HSPCs: hematopoietic stem/progenitor cells; cDCs: conventional DCs; pDCs: plasmacytoid DCs. (B) Single-cell trajectory analysis using UMAP/Monocle 3. Color is as in (A). (C) Examples of canonical gene expression used for annotation. (D) Reproducibility of technical replicates for single-cell RNA sequencing. Linear regression line displayed in gray.